's iSight camera is apparently next in line for a roasting. Users on the AnandTech forums are reporting that a purple halo, haze or flare is appearing on photos taken with the 8-megapixel snapper, when a bright light source (natural or unnatural) is just out of shot. 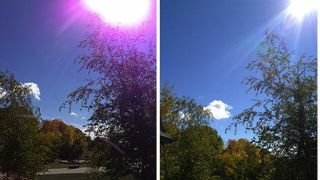 According to multiple user submissions, the unwanted tint appears on screen when taking the shot, as well as on the subsequent photo itself. Not all iPhone 5 owners are experiencing the problem, while one user posted a video showing evidence of the issue when recording video as well as stills. One view is that the issue is caused by the new sapphire crystal lens cover. However, CultOfMac points out that sapphire comes in a range of colours and thus the problem might be a result of light refracting through only the purple coloured lens covers. Mashable also examined the claims with its own tests, including the photo that accompanies this story, which seems to confirm beyond reasonable doubt that the problem does indeed exist. However, in certain circumstances it found the purple haze to be more evident in photos taken on the iPhone 4S than on the iPhone 5, so this may be a pre-existing issue. Apple is well aware of the problem, according to one forum user who called the company's tech support team. That individual was allegedly told that the issue was widespread and under investigation. TechRadar has reached out to Apple and will update this story should a response be forthcoming. Amid a litany of complaints that the aluminium coating can be chipped, scuffed and scratched too easily, Apple has also had to deal with accusations that the iPhone 5 leaks light from the top of the device. Add those alleged hardware flaws to the continued furore surrounding the Maps app, and one could be forgiven for thinking that a black cloud hangs over the launch of Apple's sixth-generation smartphone. Naturally, however, it's the most successful iPhone launch in the company's history with 5 million handsets sold during the first weekend. Go figure.